One of my favorite plants is the Palm Tree. I know, super cliche being Miami born and bred. I find the palm tree to be so very resilient. 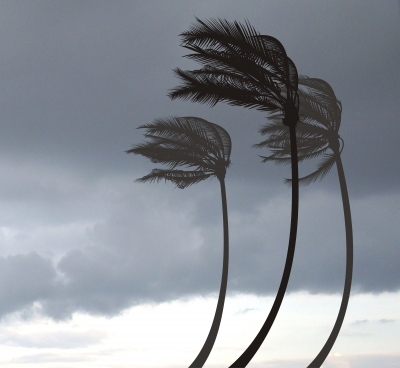 The next time you see a palm tree in a storm, take solace in knowing that they are likely up to the task. Why, even how you ask? Now, I am no botanist or dendrologist, but 1. the roots fare well in BOTH very wet and very dry soils and because of the root system it is a stable anchor. 2. In good weather their fronds spread out and make a plumage-like canopy to collect sunlight. When there are strong winds and water though? They fold up! They KNOW that with less resistance against elements they have a better chance at making it through intact. and 3. their stem isn't like the oak or pine tree where it has a cylindrical formation and can withstand compressive force (meaning it can hold the weight of the massive branches) but it is made up of a bundle approach (like cable) which allows the palm stem to BEND over through 40 or 50 degrees without snapping. Resistance is what we do to protect ourselves from awareness of that which we fear will overwhelm us. Strength comes in flexibility. Of mind, of body, of attitude. How do YOU make sense of the storms of your life? Next time, try thinking like the Palm.